From Majestic Eagles to Migrating Hummingbirds, this Exclusive Bird Watching Package with Birding Expert Eric Hynes is Available June 1 – December 20, 2019. The Hotel Telluride’s ‘Wings Over Telluride’ birding package starts from $1,099 (includes half-day birding excursion) or $1,249 (includes full-day birding excursion). Disclaimer: Available June 1 – December 20, 2019, based on double occupancy, subject to weather conditions, based on availability, blackout dates apply. Must be booked 14 days in advance, bird sightings are not 100% guaranteed. Few places are as dog-friendly as Telluride, Colo., a quaint and historic mountain town located in Southwestern Colorado, with nearly as many canine residents as humans. The Hotel Telluride could be named “Best in Show” for its attitude toward man’s best friend and offers an exclusive year-round ‘Best in Show’ pet package, available through December 31, 2019, to welcome its four-legged guests and their owners. Disclaimer: based on availability, blackout dates apply and rates vary seasonally. Must be booked 14 days in advance. The Hotel Telluride’s exclusive 3-night ‘Mountains & Morels’ package includes an exciting excursion to Lizard Head Pass for a private, guided mushroom hunt. Lunch, supplies, and literature are all included, along with your stay at the hotel. The Mountains & Morels’ package is exclusive to Hotel Telluride, and based on double-occupancy. Disclaimer: August 1 – 28, 2019. Based on double occupancy. (Subject to weather conditions and mushroom availability, based on availability and blackout dates apply). An ideal package for the adventure seeker who is looking for an alpine challenge, paired with a nice cold classic brew. Hike up Wilson Peak: a Colorado 14er and the actual mountain featured on the Coors Banquet® and Coors Light® beer cans; then enjoy one of these cold brews upon completion. Disclaimer: Based on double occupancy, availability and weather conditions; blackout dates apply. 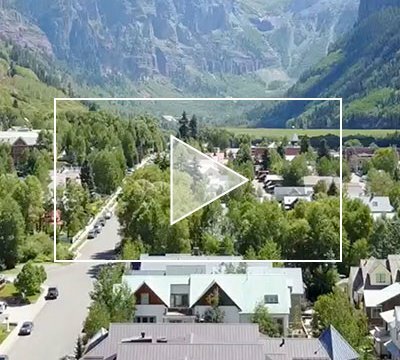 Check out footage from the air and ground, that shows off the beauty of the Hotel and Town. Get a better feel for the hotel as you zoom out from above. Fly into town and view the beautiful treetops and buildings. Take a climb up Wilson Peak on a guided tour. You can do it all on our Videos Page, with custom footage just from us. For reservations and information, call our Vacation Planners at 866-468-3501 or click the button to book online now. The Hotel Telluride Clientele: East coast families who love western charm. Like in most ski towns, Telluride hotels love western-chic decor and the pet-friendly Hotel Telluride is no exception. But strip away the antlers and you’ll find pillow-top mattresses, cushy in-room slippers, and hot tubs ready to soothe achy legs after a lap on one of North America’s most classic ski runs, Palmyra Peak.